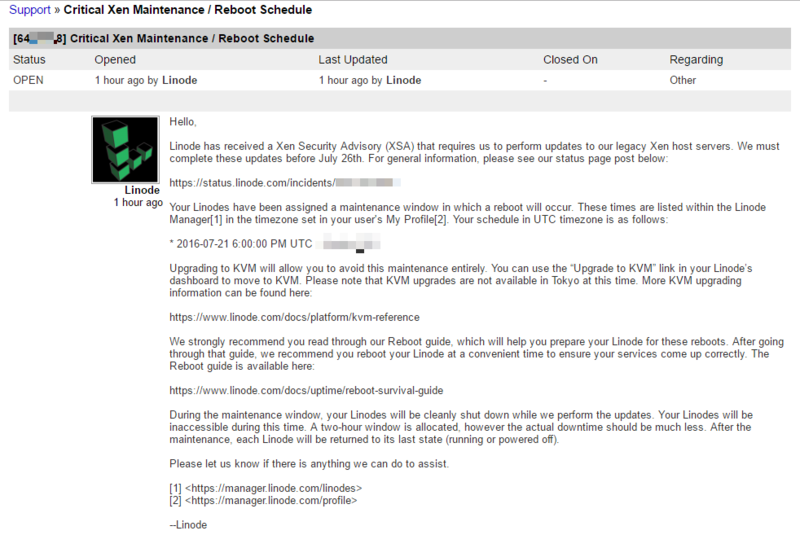 Linode has received a Xen Security Advisory (XSA) that requires us to perform updates to our legacy Xen host servers. In order to apply the updates, hosts and the Linodes running on them must be rebooted. The XSAs will be publicly released by the Xen project team on July 26th. We must complete this maintenance before then. KVM is currently not available in Tokyo, which means Linodes in Tokyo will have to undergo maintenance on-schedule. During the maintenance window, Linode instances will be cleanly shut down while we perform the updates. Your Linode will be inaccessible during this time. A two-hour window is allocated, however the actual downtime should be much less. After the maintenance, each Linode will then be booted.